Reviews of film Ek Villain starring Sidharth Malhotra, Riteish Deshmukh and Shraddha Kapoor, , directed by Mohit Surivarious by all the film critics out on Internet media. Mohar Basu Koimoi 4 Ek Villain is an indulgent affair that breaks down the boundaries of regular thriller. Mohit Suri has raised the bar with this film that is captivatingly shot and crisply edited. Raedita Tandon Filmfare 4 Though indulgent in parts, Ek Villain packs in a punch. Copy of a Korean film or not, it’s ‘good’ paisa vasool entertainment. Make it your weekend watch. 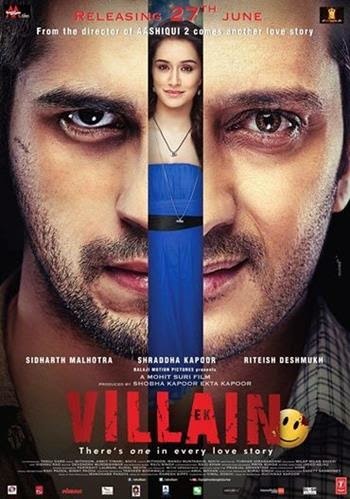 Taran Adarsh Bollywood Hungama 4 Ek Villain is a stylish, spellbinding and terrifying edge-of-the-seat thriller. It's a step forward in this genre, without doubt. A sure-shot winner! Meena Iyer Times of India 3 You cannot fault the scale of Ek Villain or berate its lead star cast. But you wish you could celebrate this thriller like you did Suri's last movie outing Aashiqui 2. This one lacks soul. Rohit Khilnani India Today 3 The dialogues are just not in sync with the plot of the film. A lot of times they break into some poetic language which neither suits their characters nor it goes with the plot. Sweta Kaushal Hindustan Times 3 Watch Ek Villain for an amazing performance by Riteish Deshmukh, the music (which is already a hit) and a well-knit plot. This is certainly not a film you would want to miss. Saibal Chaterjee NDTV 2 There is one in every love story, the film's tagline proclaims. Not true at all. Ek Villain has one too many, both among the dramatis personae on the screen and the men behind the scenes. Shubhra Gupta Indian Express 2 Sidharth Malhotra is watchable, he just seems so nice and wholesome all the time. It is Riteish Deshmukh who sweeps the stakes. Raja Sen Rediff 1.5 Why, again, is this a remake? Why would these filmmakers steal from a film and yet leave out the good parts, the bits that made those films great? And why do we do it over and over again? Komal Nahta Zee ETC - The best part of the story and screenplay is that it is supremely entertaining and absolutely engaging. In fact, so riveting is the screenplay that it is difficult to take one’s eyes off the screen for even a second. Mihir Fadnavis First Post - The villain is actually pretty well rendered by Ritesh Deshmukh. Like in almost every previous film of his, he’s a refreshingly big talent in a pool of mediocrity.